Looking to build a community around your WordPress Blog? Building a community on your WordPress Blog increases the traffic to your blog and popularize your blog in a sooner time. You no longer have to work day in and day out to get your blog visitors interact with each other. The advent of plugins has made it easier to build a community on a WordPress blog. WordPress Plugins allow easy modification, customization, and enhancement to a WordPress blog. It is a well known fact that wordpress is very easy to use CMS, it is very easy to develop a customized blog or a website on the wordpress with a very little knowledge and effort. This happens because of wordpress plugins and widgets. Take a look at these 15 incredible plugins that can enhance the interaction between your blog visitors greatly. Increase the traffic to your blog like never-before. Sounds Incredible? Yes, it is possible if you allow the blog visitors to post content. The blog readers are often those who are passionate about content. They might themselves have content or blog information that is interesting to read. So, letting your visitors publish their content on your blog is one of the fastest ways to increase the viewership and interaction among your blog readers. It doesn’t matter who posts the content. A blog that is rich in content is definitely a success. Make use of the following plugins to assign content sharing privileges to your blog visitors. This incredible plugin was created by those developers who created the world-famous WordPress Wiki. So, the usage of this plugin is like that of Wiki. The plugin allows you to assign editing privileges to certain blog posts and leave the other posts in an un-editable format. For example, you can let your blog readers edit or add extra information to some posts that needs enhancement and retain the other posts in an non-editable format. This plugin helps in displaying posts of other bloggers in your blogging site. Since this plugin includes a moderation panel, all the posts are published only after your approval. The plugin also allows you to edit the content submitted by the users. Another remarkable feature of FV Community News is that it comes with spam protection. Keep your Blog Readers tied to your Blog. You can make it possible by letting them interact with each other. Make use of the following plugins help in building interaction between the Blog Visitors. As the name implies, this plugin allows you and your blog readers to share and publish your blog posts on popular social networking sites such as Facebook, Twitter, Google, Yahoo, LinkedIn and MySpace. This plugin also allows both you and your visitors to invite more number of people to your blog. If you are looking for an easier way to build up the interaction among your visitors, then WP-forum would be of great help to you. This plugin allows you to create a discussion forum on Single WP Blogs and blogs with WordPress MU. With this plugin, you can let your visitors write notes on the margins of the blog post. It is something similar to those notes that are written in a book. Also, the notes that are added is visible to everyone. If you or your blog visitor wish to annotate a post, it can be done using Digress.it. Isn’t it interesting to have your WordPress Blog look like a Social Networking Site? Make use of the following plugins to add social networking features to your WordPress Blog. BuddyPress is a powerful social networking plugin that allows to install and setup social networking features on your blog. It offers the flexibility to choose the needed features based on your requirements. 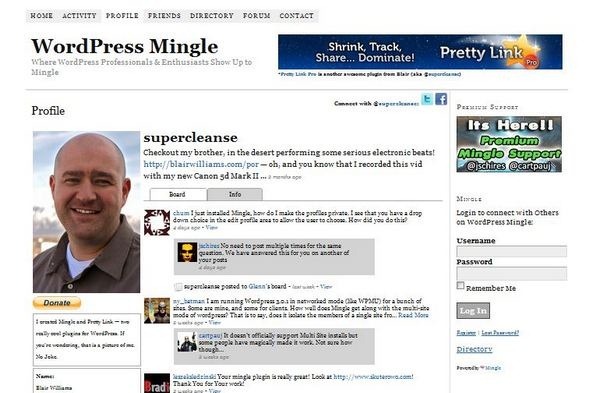 Mingle is a simple social networking plugin that allows your users to create profile pages, themes, friend lists, post status updates, social comments and email notifications. The Mingle is not only easy to set up, but also offers a variety of themes for your blog. The Customize your Community plugin allows you to change the subscribers’ WP login page and redirect them to a profile editing page. You can completely change the look and feel of the login/logout, lost password pages, so that it is free of WP branding information. This plugin lets you to create a group with several authors within BuddyPress. As a blog owner or administrator, you are allowed to provide members with registered user status for any blog within your site. It lets you customize your website by adding a front-end menu for all your users, giving them a more flexible way to modify their user-information or register new users (front-end registration). Also, grants users with administrator rights to customize basic user fields or add custom ones.Hurry! Take advantage of these 10 plugins to build a strong community out of your WordPress Blog! This post is written by WPCanvas which is a leading WordPress development company offers PSD to WordPress theme conversion services with a team of expert WordPress developers and programmers. Rekha Bisht – who has written 1 posts on Artatm – Creative Art Magazine. Thanks for posting these Plugins, Very useful once. I loved your way of explanation this post , I think Mingle is good one because it works like a social network and allows users to offers variety of themes for their blogs.